KISSIMMEE, Fla. - The experiment lasted three innings and was mostly uneventful -- which was a good thing. A-Rod handled three chances during his three innings, catching two throws for putouts and demonstrating some nice glovework on a short hop off a ground smash. "It was fun," said Rodriguez, who went 1-for-1 with a walk to increase his batting average to .324 with a .432 on-base percentage. "It was quite interesting to see, after 20 years in the league, to see the game from a totally different lens." The Yankees' preference, of course, is that a situation in which the 39-year-old Rodriguez plays first base during the regular season never comes up. 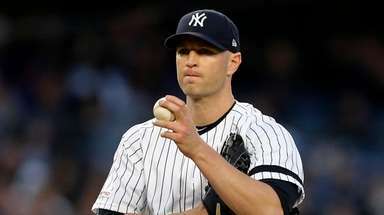 But nagging injuries to Mark Teixeira last year prompted less-than-ideal options such as Kelly Johnson, Brian McCann, Carlos Beltran, Chase Headley and even Francisco Cervelli. The Yankees enter this season with an adequate backup first baseman in Garrett Jones, but, again, sometimes the best-laid plans . . .
"It's not something that we're looking to do. It's if something happens to one of our other guys," Joe Girardi said after the Yankees' 7-0 victory over the Astros at Osceola County Stadium. "I would feel comfortable throwing him out there [in a regular-season game]. I think he would handle it just fine." Before the game, Girardi said putting Rodriguez at first is all about roster "flexibility." "This is what it gives us," Girardi said. "If something was to happen to one of our other first basemen, you have to have flexibility . . . You'd like to keep your other guys healthy is the bottom line. But as we've proven the last two years, that's not real easy to do." As if on cue, Girardi then started talking about some fresh news regarding Teixeira, who stayed back in Tampa to play in a minor-league game -- and was hit in the right knee by a pitch in the fourth inning. 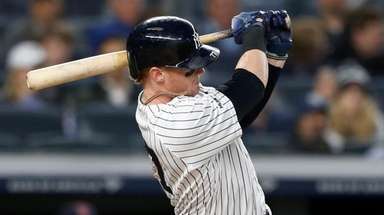 He left the game, was diagnosed with a contusion, the Yankees said, and was not scheduled for any further tests. Upon returning to Steinbrenner Field, Teixeira, who was prescribed ice treatment, told reporters he was "fine." But if this were the regular season, his prognosis for a game a day later would be in doubt. That's the reason for testing A-Rod at first. Rodriguez's biggest test Sunday came in the second when Evan Gattis led off with a hot shot that A-Rod, ranging to his right, backhanded on the short hop. The ball popped out of his glove, but Rodriguez recovered to catch it in the air before making an accurate flip to Nathan Eovaldi covering for the 3-1 putout. "I don't know if it was easy, but we got a guy out," A-Rod said. "I've never made that play. I felt like a quarterback hitting my tight end on the run." Eovaldi said of the throw: "It was good. Right in the chest. Perfect." One opposing team scout, who, like many, has not been impressed with Rodriguez at third this year, thought he looked decent enough at first. 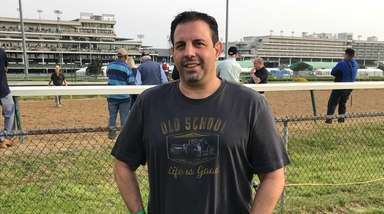 "The backhand ball, he recovered well after the bobble, and that had to be weird for him because the angle is completely different to everything he has done his whole life," the scout said. "It was a really good play on his part." Girardi said the plan is for Rodriguez to get at least one more start at first. "Any time I get to go out and play the field and play baseball, I have a good time," A-Rod said. "I do hope, in all seriousness, that I can be an asset for Joe at some point during the year. If Tex or Chase needs a blow at some point, hopefully I can be an asset for Joe."